Mangala isai by nagaswara vidwan P.K. Madurai resonated in the foyer of the Kasturi Srinivasan mini hall of the Music Academy. A lovely floral display spelt the name of the magazine which was soon to be launched that morning on Vijayadasami – an auspicious day. It was a double celebration to mark the release of the inaugural issue of SRUTI and the golden jubilee of Sangita Kalanidhi D.K. Pattammal’s concert career. The hall was packed, the audience overflowing in fact into the lobby, the foyer downstairs and even outside. It was attended and addressed by several notable figures from the world of music, dance and culture like Rukmini Devi Arundale, T.S. Parthasarathy, Semmangudi Srinivasa Iyer and T.T. Vasu. The launch of an English monthly solely devoted to Indian classical music and dance had raised eyebrows as well as expectations. 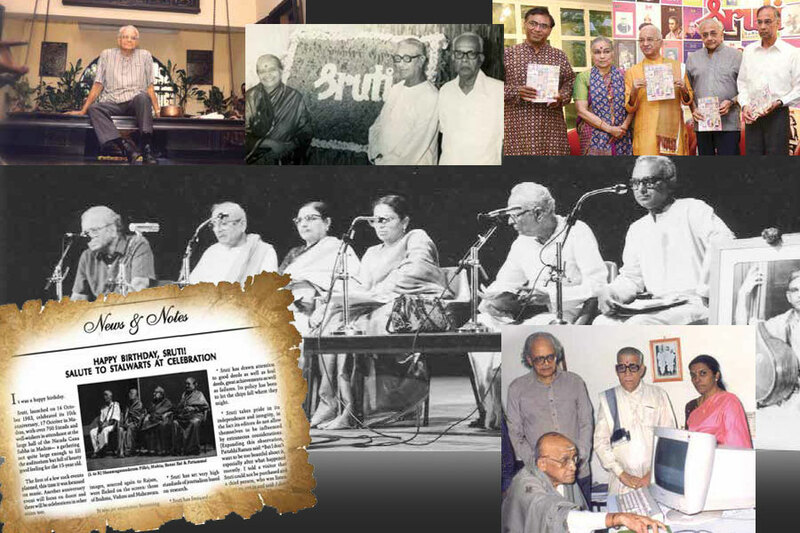 At Sruti’s request, doyen Semmangudi presented “first copies” to some 20 men and women representing rasikas, musicians, dancers, scholars, teachers, students, the media and the trade. But before that he bought a copy for himself and requested everyone to buy a copy of Sruti as a gesture of support. The function sparkled brighter with little Mandolin Srinivas playing sampradaya music on his foreign instrument. Excellence, tradition and innovation were all highlighted throughout the function, signalling Sruti’s goals. Sruti was the brainchild of N. Pattabhi Raman, and the brochure heralding its arrival, distributed by the founder-editor himself at Sri Krishna Gana Sabha, had caused quite a stir and raised expectations. To quote Sujatha Vijayaraghavan, musician, organiser, and bilingual arts writer who wrote about the ‘Sa Ga’ of Sruti on its 20th anniversary, “‘Brilliant!’ was the unanimous verdict Sruti at 35 S. Janaki of the layman and the cognoscenti. It was one of those “unputdownable” magazines. You simply had to read it from cover to cover. Articles, photographs, newsy items, naughty quips, it had everything. Suddenly, art was fun. It was no more the sombre, sublime stuff on a pedestal. The layout, the language, choice of matter—the editor’s hand was apparent on every page and paragraph.” Pattabhi Raman’s artistically laid out residence ‘Alapana’ was where Sruti was born and grew to adulthood till it moved into the premises of the Sanmar Group in 2006. NEWS & NOTES DOES MUSIC HAVE A RELIGION?